I am a firm believer in the use of sit-on-tops in whitewater. It has obvious benefits for beginner paddlers, such as stability and the ability to just climb back on after a swim. Paddling a sit-on-top is a great foundation to learn to paddle rapids and to learn different strokes and techniques. It also offers advantages for more experienced paddlers. I have seen reasonably skilled kayakers become a lot more confident when they got onto the Usutu. 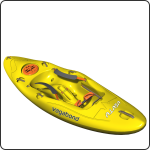 For a safety kayaker, it also offers many advantages: easy to rescue swimmers because of the range of movements possible; easy to carry swimmers because of the extra volume in the stern; and easy to jump off and back on when needed. All these benefits are only possible if the sit-on-top is well designed, of course. Most whitewater sit-on-tops are designed by either whitewater kayak designers who don’t really understand sit-on-tops, or by recreational sit-on-top designers who don’t really understand whitewater. Unfortunately, this has led to a general opinion held by many paddlers that sit-on-tops don’t really work for whitewater. It is my mission to change this perception. A few years ago I designed a range of whitewater sit-on-tops for my previous company, which I still consider to be some of the best ever on the market. Since then, I’ve spent a lot of time evaluating my own past designs as well as those of competitors. There are a few good designs out there. My aim with Vagabond is not to make more of the same. I will only launch a new model if I’m sure it is substantially different and better than anything else on the market. So, when I started working on the Usutu design, I wanted to make sure it would be on a different level. The easiest way to summarise my priority for this design is: instead of being a sit-on-top that handles whitewater well, I wanted it to be a real whitewater kayak that happens to be a sit-on-top. Makes sense? The Usutu hull has the same basic characteristics as the Vubu and Pungwe hulls: lots of stability, good speed in whitewater, great edge control, and above all, it is super forgiving. Even though it is wider than a normal whitewater kayak, once you’re on the water it doesn’t feel like it. I managed to create a hull that simply feels like a real whitewater kayak. The pivot point is the same, the way you lead your moves with your head is the same, the way you connect with the boat feels the same. Nothing makes a sit-on-top behave like a barge like when tens of litres of water are dumped in the cockpit when punching through waves. To compensate for this I’ve put some really big scupper holes through the boat to make water drain instantly. To protect the bottom edges of the scupper holes from impact and abrasion, I put grooves in the hull. Generally, grooves in the hull of a whitewater kayak are not ideal, but I decided to put these grooves to good use. The size, curve and placement of these grooves actually assist in the control of the boat when catching eddies or doing ferry glides. I combined this great hull with a cockpit that really keeps you locked into the boat, without the risk of getting stuck if you decide to go for a swim. There are enough contact points between your body and the cockpit to have direct control of the boat. The thigh straps are positioned to keep you in place in rough conditions, but when you want to bail, they won’t hinder your effort of abandoning ship. You can, of course, use the thigh straps to roll the boat too. I gave the bow some good volume and a peaked deck to ride through and over waves, and to resurface quickly when submerged. I gave the stern even more volume for great stability in rough water. It is also great for rescuing swimmers as the stern won’t submerge when you pull a swimmer onto the back deck. The hatch and large volume of the stern also mean that multi-day whitewater trips can easily be done with the Usutu. Finishing off the design, I gave it a bunch of strategically-placed handles. These handles help a lot when dealing with swimmers in a rescue situation. They also help if you take a swim and need to grab your boat to get back onto it. To get back to my stated goal with the Usutu design… This is a real whitewater kayak. It just happens to be a sit-on-top, with all the benefits that a sit-on-top generally implies (most importantly, it floats when capsized!). It is a whitewater kayak as much as the Vubu and Pungwe are whitewater kayaks.